You can go ahead and remove the term “trend” when talking about custom painted football cleats in the NFL. 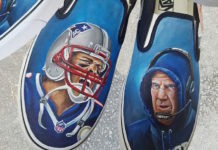 For Super Bowl 52 at least 14 players were wearing a pair of cleats painted by a sneaker customizer. 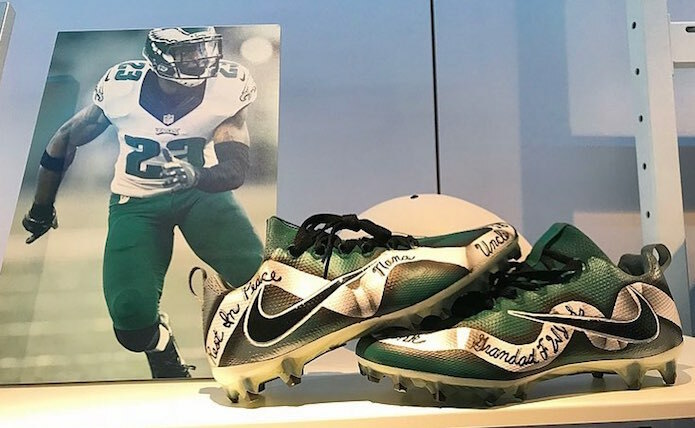 Painted cleats made specifically for the biggest game of the players’ careers were split with 9 for the Philadelphia Eagles and 5 for the New England Patriots. For Super Bowl 51 we counted only 5 pairs. As the My Cause, My Cleats initiative hopefully continues next season we can only expect more and more players to be open to wearing custom painted football cleats week in and week out. Especially if they are lucky enough to make it to the biggest game of the season. The Eagle’s Jalen Mills sported the most flashy carrying motivation from “Big Rings” by Drake and Future. The duo’s lyrics and title, “What A Time, To Be Alive” graced the sides and the toes were covered in diamonds hand painted by @sierato. On the final hail mary throw by Tom Brady, Eagle’s defenders Ronald Darby (left), Rodney Mcleod (middle), Corey Graham (24), Jalen Mills (2nd from the right) can all be seen just about to shut the pass down in their custom painted football cleats. Kyle Van Noy kept it close to last year’s Super Bowl sticking with Nike cleats painted by @DejesusCustomFootwear in a Patriots theme.